Myeloproliferative diseases are a heterogeneous group of disorders characterized by cellular proliferation of one or more hematologic cell lines in the peripheral blood, distinct from acute leukemia. 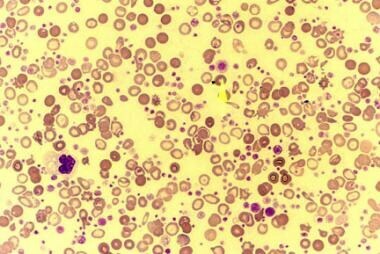 The peripheral smear below shows leukoerythroblastosis and giant platelets in a patient withmyelofibrosis. Peripheral smear of a patient with agnogenic myeloid metaplasia (myelofibrosis) shows leukoerythroblastosis. This photomicrograph also shows giant platelets. Patients are at risk for thrombotic and hemorrhagic events. They are also at risk of developing secondary acute leukemia from their underlying disorder, as well as from their treatment. Bone marrow aspiration and biopsy with cytogenetic studies are required in most, but not all, patients. Cytogenetic studies detect the presence or absence of the Philadelphia chromosome and help to differentiate myeloproliferative disorders from myelodysplastic syndrome. Bone marrow histology shows hypercellularity in most of these disorders. In the case of myelofibrosis, bone marrow fibrosis is demonstrated on the reticulin stain. Bone marrow fibrosis is also detected in the spent phase of chronic myelogenous leukemia and polycythemia vera. Hematopoietic stem cell transplantation can be considered in young patients with chronic myelogenous leukemia in chronic phase if a human leukocyte antigen (HLA)-matched donor is available. Low-dose cytosine arabinoside: When added to interferon alfa, has been reported to increase remission rates. Dasatinib (Sprycel): Indicated for the treatment of adult patients with chronic myeloid leukemia in chronic, accelerated, or myeloid or lymphoid blast phase who are resistant or intolerant to prior therapy including imatinib. Treatment for this disease is palliative. Young (< 40 y), asymptomatic patients with polycythemia vera can be considered for therapeutic phlebotomies alone to maintain a hematocrit level of less than 45%. Other patients can undergo myelosuppressive therapy with hydroxyurea. Radioactive phosphorous can be used as an alternative therapy in older patients. No curative treatment is available. The aim of therapy is to maintain the patient’s platelet count within the reference range. This usually can be achieved with hydroxyurea or anagrelide. Asymptomatic patients can be monitored clinically until symptomatic. Hydroxyurea is useful to suppress the number of circulating cells. Patients with painful, massively enlarged spleens refractory to myelosuppressive therapy are occasionally treated with radiation therapy, but they may ultimately require splenectomy. In November 2011, a JAK1/JAK2 inhibitor, ruxolitinib (Jakafi), became the first US Food and Drug Administration (FDA)–approved drug for patients with intermediate- or high-risk myelofibrosis. Myeloproliferative diseases (MPDs) are a heterogeneous group of disorders characterized by cellular proliferation of one or more hematologic cell lines in the peripheral blood, distinct from acute leukemia. 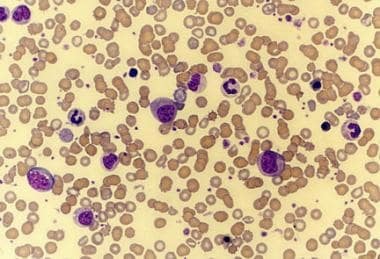 Peripheral smear of a patient with chronic myelogenous leukemia (CML) shows leukocytosis with extreme left shift and basophilia. In 2002, the World Health Organization (WHO) proposed an alternate classification schema for these diseases, adding chronic neutrophilic leukemia (CNL) and chronic eosinophilic leukemia (CEL)/hypereosinophilic syndrome (HES). The WHO updated its classification in 2008 and changed the nomenclature from “chronic myeloproliferative disease” to “myeloproliferative neoplasms”. For a comparison of the FAB and 2008 WHO classification systems, see the table below. In some patients, conditions overlap, and clear categorization may be difficult. Myeloproliferative disease may evolve into one of the other myeloproliferative conditions, transform to acute leukemia, or both. Some evidence indicates that myeloproliferative diseases arise from malignant transformation of a single stem cell. Involvement of erythropoiesis, neutrophilopoiesis, eosinophilopoiesis, basophilopoiesis, monocytopoiesis, and thrombopoiesis occurs in the chronic phase of CML. Some evidence also indicates that lymphocytes are derived from primordial malignant cells. This is based on observations that a single isoenzyme for glucose-6-phosphate dehydrogenase (G6PD) is present in some T and B lymphocytes in women with CML who are heterozygous for isoenzymes A and B. Data from glucose-6-phosphate dehydrogenase (G6PD) studies, cytogenetic analyses, and molecular methods have established the clonal origin of myeloproliferative diseases; this clonality potentially occurs at different stem cell levels. An attribute common to these disorders appears to be an acquired activating mutation in the gene coding for various tyrosine kinases. Peripheral smear of a patient with essential thrombocythemia (ET) shows markedly increased number of platelets. Some of the platelets are giant (arrow). 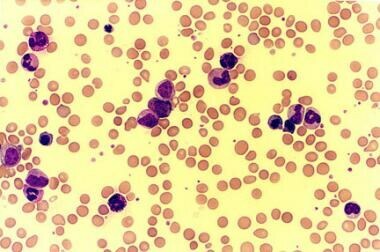 Photomicrograph of a peripheral smear of a patient with agnogenic myeloid metaplasia (myelofibrosis) shows findings of leukoerythroblastosis, giant platelets, and few teardrop cells. The American Cancer Society estimates that 8820 new cases of chronic myelogenous leukemia (CML) will be diagnosed in the United States in 2016. CML accounts for more than half of myeloproliferative disease cases. The incidence of polycythemia vera in the United States is approximately 5-17 cases per 1 million population per year. True incidences of essential thrombocythemia and myelofibrosis are not known because epidemiological studies on these disorders are inadequate. The incidence of polycythemia vera is 0.02-2.8 per 100,000 per year [15, 16] ; Japan has the lowest incidence. Essential thrombocythemia has an incidence of 0.1-1.5 per 100,000 per year. Myelofibrosis has an international incidence of 0.4-0.9 per 100,000 per year. In the United States, the American Cancer Society estimates that 1070 deaths from chronic myelogenous leukemia (CML) will occur in 2016. Exact mortality and morbidity rates of other myeloproliferative diseases are unknown. Most cases encountered in clinical practice are in patients aged 40-60 years. Myeloproliferative diseases are uncommon in people younger than 20 years and are rare in childhood. O'Brien SG, Guilhot F, Larson RA. Imatinib compared with interferon and low-dose cytarabine for newly diagnosed chronic-phase chronic myeloid leukemia. N Engl J Med. 2003 Mar 13. 348(11):994-1004. [Medline]. Vardiman JW. The World Health Organization (WHO) classification of the myeloid neoplasms. Blood. 2002. 100:2299-2300. [Medline]. [Full Text]. Chaiter Y, Brenner B, Aghai E, Tatarsky I. High incidence of myeloproliferative disorders in Ashkenazi Jews in northern Israel. Leuk Lymphoma. 1992 Jun. 7 (3):251-5. [Medline]. Baxter EJ, Scott LM, Campbell PJ. Acquired mutation of the tyrosine kinase JAK2 in human myeloproliferative disorders. Lancet. 2005 Mar 19-25. 365(9464):1054-61. [Medline]. James C, Ugo V, Le Couedic JP. A unique clonal JAK2 mutation leading to constitutive signalling causes polycythaemia vera. Nature. 2005 Apr 28. 434(7037):1144-8. [Medline]. Sonbol MB, Firwana B, Zarzour A, Morad M, Rana V, Tiu RV. Comprehensive review of JAK inhibitors in myeloproliferative neoplasms. Ther Adv Hematol. 2013 Feb. 4(1):15-35. [Medline]. [Full Text]. Ursuleac I, Colita A, Adam T, Jardan C, Ilea A, Coriu D. The concomitant occurrence of JAK2V617F mutation and BCR/ABL transcript with phenotypic expression - an overlapping myeloproliferative disorder or two distinct diseases? - case report. J Med Life. 2013 Mar 15. 6(1):34-7. [Medline]. [Full Text]. Mesa RA, Powell H, Lasho T, Dewald G, McClure R, Tefferi A. JAK2(V617) and leukemic transformation in myelofirbrosis with myeloid metaplasia. Leuk Res. 2006/11. 30 (11):1457-60. Anand S, Stedham F, Beer P, et al. Effects of the JAK2 mutation on the hematopoietic stem and progenitor compartment in human myeloproliferative neoplasms. Blood. 2011 Jul 7. 118(1):177-81. [Medline]. Pardanani A, Brockman SR, Paternoster SF. FIP1L1-PDGFRA fusion: prevalence and clinicopathologic correlates in 89 consecutive patients with moderate to severe eosinophilia. Blood. 2004 Nov 15. 104(10):3038-45. [Medline]. [Full Text]. Levine RL. Another Piece of the Myeloproliferative Neoplasms Puzzle. N Engl J Med. 2013 Dec 10. [Medline]. Nangalia J, Massie CE, Baxter EJ, Nice FL, Gundem G, Wedge DC, et al. Somatic CALR Mutations in Myeloproliferative Neoplasms with Nonmutated JAK2. N Engl J Med. 2013 Dec 10. [Medline]. Nelson R. New Gene Mutation Found in Myeloproliferative Neoplasms. Medscape Medical News. Available at http://www.medscape.com/viewarticle/817704. Accessed: December 16, 2013. Cancer Facts & Figures 2016. American Cancer Society. Available at http://www.cancer.org/acs/groups/content/@editorial/documents/document/acspc-044552.pdf. Accessed: February 26, 2016. Johansson P, Kutti J, Andreasson B. Trends in the incidence of chronic Philadelphia chromosome negative (Ph-) myeloproliferative disorders in the city of Goteborg, Sweden, during 1983-99. J Intern Med. 2004 Aug. 256(2):161-5. Kutti J, Ridell B. Epidemiology of the myeloproliferative disorders: essential thrombocythaemia, polycythaemia vera and idiopathic myelofibrosis. Pathol Biol (Paris). 2001 Mar. 49(2):164-6. [Medline]. Scherber R, Dueck AC, Johansson P, et al. The Myeloproliferative Neoplasm Symptom Assessment Form (MPN-SAF): international prospective validation and reliability trial in 402 patients. Blood. 2011 Jul 14. 118(2):401-8. [Medline]. Donato NJ, Talpaz M. Clinical use of tyrosine kinase inhibitors: therapy for chronic myelogenous leukemia and other cancers. Clin Cancer Res. 2000 Aug. 6(8):2965-6. [Medline]. Bjorkholm M, Derolf AR, Hultcrantz M, et al. Treatment-related risk factors for transformation to acute myeloid leukemia and myelodysplastic syndromes in myeloproliferative neoplasms. J Clin Oncol. 2011 Jun 10. 29(17):2410-5. [Medline]. [Full Text]. Jovanovic JV, Ivey A, Vannucchi AM, Lippert E, Oppliger Leibundgut E, Cassinat B, et al. Establishing optimal quantitative-polymerase chain reaction assays for routine diagnosis and tracking of minimal residual disease in JAK2-V617F-associated myeloproliferative neoplasms: a joint European LeukemiaNet/MPN&MPNr-EuroNet (COST action BM0902) study. Leukemia. 2013 Jul 17. [Medline]. Kaplan ME, Mack K, Goldberg JD. Long-term management of polycythemia vera with hydroxyurea: a progress report. Semin Hematol. 1986 Jul. 23(3):167-71. [Medline]. FDA approves Jakafi to treat patients with a chronic type of bone marrow disease. U.S. Food and Drug Administration. Available at http://www.fda.gov/NewsEvents/Newsroom/PressAnnouncements/ucm425677.htm. December 4, 2014; Accessed: February 26, 2016. Cervantes F, Correa JG, Hernández-Boluda JC. Alleviating Anemia and Thrombocytopenia in Myelofibrosis Patients. Expert Rev Hematol. 2016 Feb 18. [Medline]. FDA approves first drug to treat a rare bone marrow disease. U.S. Food and Drug Administration. Available at http://www.fda.gov/NewsEvents/Newsroom/PressAnnouncements/ucm280102.htm. November 16, 2011; Accessed: February 26, 2016. Prasad KN, Manjunath P, Priya L, Sasikumar S. Overcoming the problem of pseudohypoxemia in myeloproliferative disorders: Another trick in the bag. Indian J Crit Care Med. 2012 Oct. 16(4):210-2. [Medline]. [Full Text]. Klampfl T, Gisslinger H, Harutyunyan AS, Nivarthi H, Rumi E, Milosevic JD, et al. Somatic Mutations of Calreticulin in Myeloproliferative Neoplasms. N Engl J Med. 2013 Dec 10. [Medline]. Kralovics R, Passamonti F, Buser AS. A gain-of-function mutation of JAK2 in myeloproliferative disorders. N Engl J Med. 2005 Apr 28. 352(17):1779-90. [Medline]. Levine RL, Wadleigh M, Cools J. Activating mutation in the tyrosine kinase JAK2 in polycythemia vera, essential thrombocythemia, and myeloid metaplasia with myelofibrosis. Cancer Cell. 2005 Apr. 7(4):387-97. [Medline]. O'Brien S, Tefferi A, Valent P. Chronic myelogenous leukemia and myeloproliferative disease. Hematology (Am Soc Hematol Educ Program). 2004. 146-62. Staerk J, Kallin A, Demoulin JB. JAK1 and Tyk2 Activation by the Homologous Polycythemia Vera JAK2 V617F Mutation:CROSS-TALK WITH IGF1 RECEPTOR. J Biol Chem. 2005 Dec 23. 280(51):41893-9. 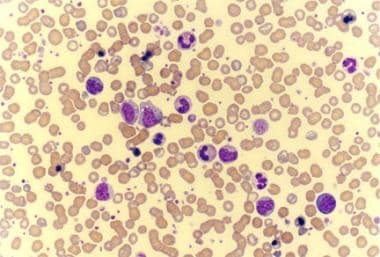 Peripheral smear of a patient with chronic myelogenous leukemia (CML) in blastic phase shows several blasts. Table. Comparison of FAB and WHO Classifications of Chronic Myeloproliferative Diseases.